A top Azerbaijan investigative journalist, in jail since December 2014, has been freed on the order of the country's supreme court. Khadija Ismayilova's seven-and-a-half year sentence for corruption prompted international outrage and her cause was taken up by rights lawyer Amal Clooney. Critics argue she was singled out for investigating businesses close to the family of President Ilham Aliyev. The court commuted her sentence to a suspended three-and-a-half year term. Ismayilova later told the BBC she would fight on to clear her name: "They dropped two charges and two charges are still remaining. I'm still convicted on illegal entrepreneurship and tax evasion and I haven't been doing any entrepreneurship. "The charges are false and illegal. So, I will of course go further to get them dropped as well." Ismayilova added that, despite appearances, the Azeri government was not softening its attitude towards its critics. "There is a revolving door of the prison. They release two, they arrest three. So more people are getting arrested. "You think this problem is getting solved. No, it's not being solved. But sometimes the government is trying to satisfy the international critics and release some people." Ismayilova had herself made allegations of massive embezzlement of oil funds by government ministers. During her trial she said it was not a coincidence that she had been charged with embezzlement and tax evasion, as these were the crimes she had written and spoken about. The reason behind the court's decision to release Ms Ismayilova is unclear. But Ms Clooney's team had submitted a case to the European Court of Human Rights in March and a decision was expected. Outside court Ms Ismayilova told reporters that her arrest had been solely for political reasons. "I will of course go further to the European Court (of Human Rights) and I will hold the Azerbaijani government responsible for keeping me in prison for a year-and-a-half, keeping me out of my job and (away from) my family". 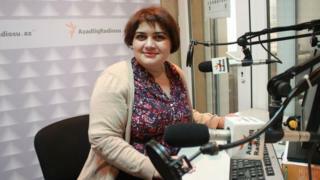 She became well known in Azerbaijan for a daily talk show on the Azeri service of Radio Free Europe/Radio Liberty (RFE/RL), but her outspoken tone led to personal attacks and accusations of being "pro-Armenian" or an "international agent". Arrested in late 2014, she was put on trial in July last year in a process she condemned as politically motivated. Amnesty International described Ismayilova as a prisoner of conscience. In a report last year, Human Rights Watch accused Azerbaijan of escalating repression against its critics and using "spurious charges" to imprison them. It also alleged that torture and ill-treatment were used with impunity. President Aliyev vehemently rejects allegations of human rights abuses.